Look who's back after a year and a half! About a year ago, I got the idea to do a CWS with Egon. I've been a Ghostbusters fan most of my life, after all, and Egon is my favorite. (Most of the time. Sometimes, I'm a Winston kind of girl.) That adoration for Egon was paralyzing, though! I'm not as funny as Ramis and Aykroyd. I'd do it wrong. And what if Ramis or Aykroyd saw this?! Then I remembered it's a pony comic, and hardly anyone reads it. Ha. Although I have to admit, growing up my favorite was always Peter. Or possibly Ray. Ma Kent would be ashamed of Clark, I bet she taught him to clean a kitchen better than that, heh. Supe looks so taken aback by the brain tissue request. "You can't have my brain tissue! I'm still using it!" How does one tell if Egon is excited, anyway? I'm sure he was thrilled by the fungus specimens... at least as thrilled as he gets. I must confess. I've never seen a single episode. The different angles you used to get varying expressions from Superman brilliant. He looks so disgusted in the one panel and completely taken aback in another. I'm honestly amazed by how much emotion you can get from an action figure. I love your comic and Cooking with Superman holds a special place in my heart. This one may be my all time favorite. Have you thought about doing a collection? I would love (and pay for) PDFs. Squee, Supes is back! 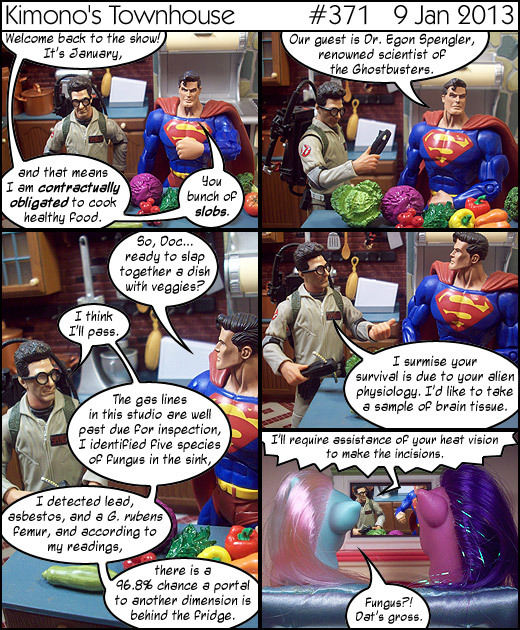 The special guests on his show are my favorite part and Egon is especially great, heh. *squeeee! * Egon! I had a crush on him in my youth. I even liked the cartoon version, though he couldn't quite hold a candle to the live-action version. OK, I'm pretty sure I'm missing something here, but as far as I can find, G. Rubens is a species of grasshopper? I was just going back through your Cooking with Superman tag. It's always been my favorite part of the comic, even though I came for the ponies originally. I hope you do more soon!